How your career choice can either steal your time and energy or add to your time and energy. The full chapter on Employment will show you how to ensure you work and get rewarded in your areas of passion and interest. Understanding your Employment options means more choices and ultimately more money and more freedom. The last two are discussed on other pages on the site. Of these three, the most limiting, and the least flexible and with the least chance of creating a lifestyle is employment. You work for someone else and your income is limited by the hours you work and in some cases by the commissions you earn. If you take a year off, you receive nothing. Strangely “finding a job” is what we are told to do by our parents, our schools, our Technical Institutes and our Universities. We have not been taught to be business owners or real estate owners or developers. This is partly because the economy needs employees so businesses and state owned enterprises can succeed. 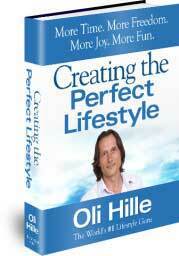 Most of the time being employed is not the road to your Perfect Lifestyle. This is not to say that for some people being employed is exceptionally beneficial. For example my wife Fleur is a nurse. There is no job she loves more than helping and nursing sick people. For her, working as a nurse is part of her Perfect Lifestyle. She is not interested in turning this passion into a business. She is not interested in owning a private hospital or a nursing employment agency. What she loves is actually being with patients and nursing them. You may be the same. What you really enjoy in a job may primarily only exist in an employee role. Once again it is about identifying your passions and what you really enjoy. Search for a job that involves something you love or are passionate about. Try to ensure you will be working with great people who will challenge and stimulate you to grow. Your job is a stepping stone, not a destination. Learn as much as you can from everyone you can (including customers and suppliers and top management). In the 21st Century people who can understand and manage the multiple functions of an organization will be very well rewarded. Especially when it is your own organization.